Multiplication of effort has the power to allow you to achieve extraordinary, profitable growth through a structure that allows for a balanced life; however, you choose to define balanced. Empowered, energized people result in multiplication of effort that GROWS business. If you want your employees to be defined this way, you must invite them to be more than just an order-taking drone by cultivating a culture of energized employee empowerment. Every employee you have will eventually arrive at an intersection, if they haven’t already. At that point, you hope they turn the right way and buy-in to the vision and values of the company. Turning the right direction means that they see a future for themselves within the organization, so they’ll invest themselves fully and go all-in. 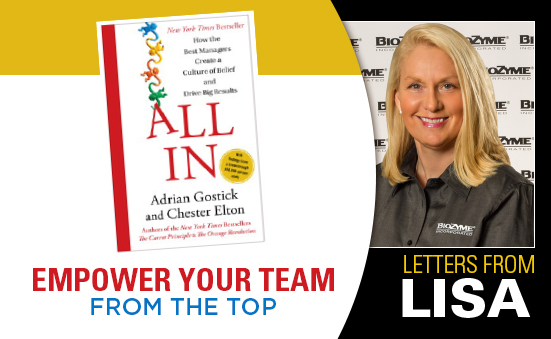 In the book “All In,” leading workplace experts teamed up with research giant Towers Watson to analyze an unprecedented 300,000 people, and they made a groundbreaking finding: managers of the highest-performing work groups create a “culture of belief.” In these distinctive workplaces, people believe in their leaders and in the company’s vision, values and goals. Employees are not only engaged but also enabled and energized (termed the three Es), which leads to astonishing results—average annual revenues three times higher than for organizations lacking such a positive culture. What does it take to accomplish a culture of “All In”? Ask yourself these questions. (Please note that those in bold are my weaknesses and what I am constantly working on trying to improve. I figure putting them in bold can be kind of like making my New Year resolutions public enough that I do them). 1. Do you really care? Beyond praise and financial worth, can you really say you care for the well-being of others? Selfishness has no place in empowerment. The more you care, the greater the results you can generate. 2. Do you listen? When you stop and truly listen to those that you interact with, do you provide others with a sense that you are all in? Being all in really matters when it comes to having others follow your lead, so you better be listening to any constructive criticism you receive. 3. Do you freely admit your mistakes? Great leaders recognize that they don’t always make the best or right choices, and they don’t blame others for those choices. Instead, a true leader finds the error, fixes it and moves on. 4. Are you open and adaptable to change? Leaders must be constantly open to new ideas and cultivate this throughout the team. Now more than ever before, you simply cannot stay with the status quo and expect others to be on that band wagon with you. 5. Can you laugh? If not, why do we want to hang around with you? Being open to having fun is by far one of the most enjoyable feelings, especially in the workplace. After all, most people spend the vast majority of their lives working, shouldn’t they enjoy it? 6. Are you making decisions? Only decisive people succeed, the indecisive ones never do. As a leader try to focus on making crucial decisions and delegate the trivial ones. 7. Are you cultivating a way for new ideas to be easily brought forward? Every business revenue generator or cost saver starts with an idea. I have learned that those really doing the work on a daily basis always have ideas, usually good ones, but they are not given safe, easy ways to share them. 1. Hold Them Accountable. Remember that employer trust and employee autonomy is a two-way street. Holding employees accountable for their work and for meeting established goals and deadlines motivates them to achieve better results. Don’t let them off the hook. Demand their best effort. 2. Provide Constructive Feedback. Regardless of the results, let them know how they’re doing, and give them the coaching they need to improve. Although they might not always ask for it, they want and need your feedback to further develop their knowledge and skills. At BioZyme ® we recently replaced Performance Reviews with Progress Reviews. Progress Reviews should be done when opportunities for personal development occur, not every December. 3. Acknowledge Them on the Spot for Stepping Up. A few seconds of genuine one-on-one acknowledgement and recognition can go a long way toward reinforcing an employee’s willingness to step up and stand tall. Show you appreciate their above-and-beyond commitment with a reward that matches the result. Often times, the best reward is additional trust and an added level of responsibility. 4. Have Confidence and Trust in Them. Confidence has the power to generate passion which provides for opportunity that would otherwise seem impossible. Trust is an absolute prerequisite of efficiency. Therefore, confidence and trust are natural leverages for successful growth. I usually try to close in a motivational positive way, but I thought these facts were pretty motivational despite not being all that positive. According to a survey of 23,000 employees conducted by Harris Interactive, only 37 percent of employees understand what their employer is trying to achieve. Pretty hard to be “all in” when you don’t even know what “in” is.